Our journey, this month, has brought us to Thailand, a constitutional monarchy presently under King Maha Vajiralongkorn. 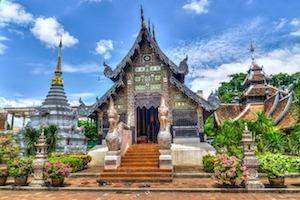 Thailand was formerly known as "Siam" and its history shows that the country’s culture was heavily influenced by India followed by China, Cambodia, Lao, and Burma. Thailand's national religion, Theravada Buddhism, is central to modern Thai identity. Thailand’s economy is the 2nd largest in Southeast Asia after Indonesia, and is heavily export-dependent, with exports accounting for more than two-thirds of the country’s gross domestic product (GDP). Major exports include rice, textiles and footwear, fishery products, rubber, jewelry, cars, computers, and electrical appliances. Tourism makes up about 6% of the economy, with Thailand having been the most visited country of Southeast Asia in 2013, according to the WTO. Thai cuisine blends five fundamental tastes- sweet, spicy, sour, bitter, and salty. Common ingredients used in Thai cuisine include garlic, chilies, lime juice, lemon grass, coriander, and palm sugar. This month’s snack selection was done by Divya, who right now wishes she was in Thailand enjoying these sumptuous snacks along with other Thai delicacies, followed by a nice massage listening to soothing Zen-like music. Bin Bin rice crackers are made from the best natural rice in the world –“Jasmine Thai Rice”. The rice crackers carry with it a unique oriental style distinct flavor, which make it a best seller in overseas Asian markets. Bin Bin rice crackers are baked to give it a light and crunchy texture, while the Tamari sauce and natural seasonings give it a slightly sweet and savory flavor – making it all the more irresistible. Jackfruit is inherently sweet tasting and is called the ‘queen of fruits’in South East Asia. It contains a high amount of nutrients like vitamins, minerals, electrolytes, phytonutrients, carbohydrate, fiber, fat and protein. It is also a good source of calories and contains no cholesterol or saturated fats. It is rich in antioxidants which protects from cancer, ageing and degenerative diseases. These chips are cooked using the vacuum frying system, leaving the chips to be crunchy, crispy and delicious. More importantly, its nutrients and flavor are well preserved and amount of fat is reduced dramatically. Once you start having jackfruit chips, there is a strong tendency to get hooked to them because they are so delicious. These are fried rolls, with a strong coconut taste that leaves you wanting for more. They are crispy, light and crunchy by nature and is prepared using rice flour and whole coconuts. It is widely popular all over Thailand and is known in Thai as “Tong muan”. The coconut rolls are quite heavy and filling while also being nutritious at the same time. Tao Kae Noi is the largest seaweed manufacturer in Thailand, with more than 70% of the market share. This snack is exactly what it says – crispy seaweed. If you are new to seaweed – this original flavor is a good starting point. It has a distinct flavor you will fall in love with and is best suited as a leisurely evening snack and pairs well with a bottle of beer, while enjoying a crisp ocean breeze. Most people would be familiar with banana chips, but these take the cake among all banana chips. These sweetened banana chips make a light, sweet snack. Each piece is crunchy and packed with all-natural rich flavor. High in potassium, banana chips are a healthy treat for kids and grown-upsalike. Enjoy these crispy fruit chips tossed over salads or in a dried fruit mix. TopMunch was formed with a mission to educate people about the different cultures in the world. The learning curve is incomplete if people do not understand the native language, and with this in mind TopMunch has launched TopPhrase. TopPhrase provides our customers with basic phrases and their usages in each country, so that everyone would be able to conduct basic conversations with locals of that country. We, at TopMunch, believe in helping our customers experience all the flavors, sights, sounds and languages that every culture around the world has to offer. With this mission, we have launched our travelogue –TopTravel, whereby we will strive to inform you about some of the sights in every country along with local tips about how to gain an experience that can be preserved in your treasure chest of memories. Through TopTravel, we will not only be opening your eyes to the different sights in a country but shall also be helping you plan your next getaway or vacation to that country. We continue our journey to the beautiful country of Thailand. Asian tourists primarily visit Thailand for Bangkok and the historical, natural, and cultural sights in its vicinity. Western tourists also travel to the southern beaches and islands. The north is the chief destination for trekking and adventure travel with its diverse ethnic minority groups and forested mountains. CHIANG RAI: This city is full of ancient temples of which Wat Rong Khun(“The White Temple”) is the most famous. The artist who built it created a surreal representation of what he sees as obstacles to the path of enlightenment. KRABI: Krabi is a beach town on the southwest coast that boasts of crystal clear waters, pristine beaches, and impressive seaside cliffs. Once here, it is an absolute must that you head to the nearby RailayBeach (only accessible by boat) for what is undeniably the best sunset in the country. AYUTTHAYA HISTORICAL PARK: Ayutthaya is an amazing historic national park and a UNESCO World Heritage Center. It was destroyed in 1767 during a civil war with Burma, and burned to the ground. Over the years, much of Ayutthaya has been unearthed to form an archaeological park. ANGKOK’s GRAND PALACE: Following the destruction of Ayutthaya (which was the then capital of Thailand), the capital was shifted to Bangkok where the Grand Palace was built. Do not miss the Royal Monastery of the Emerald Buddha, the upper terrace which has a Golden dome, a miniature version of Angkor Wat and a Royal Pantheon. During night time the palace is illuminated with lights making it a romantic sight to see. SUNDAY NIGHT MARKET –CHIANG MAI: Chiang Mai, also known as the Rose of the North, is host to a night bazaar every evening which is a must visit for bargain shoppers - especially for clothes. Sunday Night is the best when the bazaar transforms into a “Walking Street” with art & craft stalls popping up and the most delicious street-food you would ever have tasted being served. Do try some “laab”, “nam prik yong” and “khao kha mu” if you get a chance. Visit the Golden Triangle -the point at which Burma/Myanmar, Laos and Thailand meet. When in Chiang Mai, do visit the “Elephant Nature Park” and the “Tiger Kingdom” for a surreal experience of having your picture taken with elephants and tigers. Visit the Karen “Long Neck” Hill Tribe, where many of the women wear brass coils(weighing upto 30 pounds)wrapped around their necks. Do not miss out on visiting the FloatingMarketsnear Bangkok. For Honeymooners–PhiPhiIslandsis where we recommend you to goto.